Background: During a mass gathering, some participants may receive health care for injuries or illnesses that occur during the event. In-event first responders provide initial assessment and management at the event. However, when further definitive care is required, municipal ambulance services provide additional assessment, treatment, and transport of participants to acute care settings, such as hospitals. 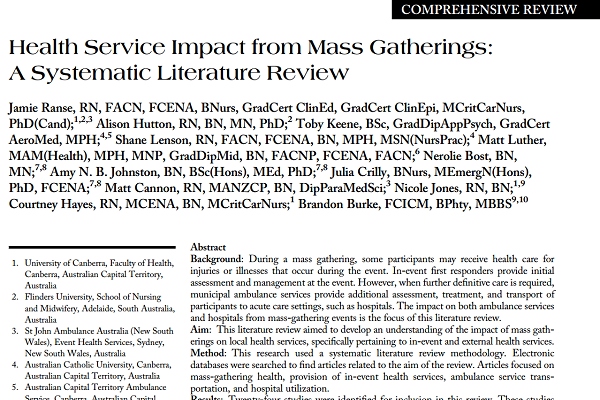 The impact on both ambulance services and hospitals from mass-gathering events is the focus of this literature review. 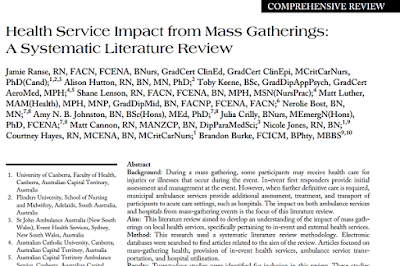 Aim: This literature review aimed to develop an understanding of the impact of mass gatherings on local health services, specifically pertaining to in-event and external health services. Method: This research used a systematic literature review methodology. Electronic databases were searched to find articles related to the aim of the review. Articles focused on mass-gathering health, provision of in-event health services, ambulance service transportation, and hospital utilization. Results: Twenty-four studies were identified for inclusion in this review. These studies were all case-study-based and retrospective in design. The majority of studies (n = 23) provided details of in-event first responder services. There was variation noted in reporting of the number and type of in-event health professional services at mass gatherings. All articles reported that patients were transported to hospital by the ambulance service. Only nine articles reported on patients presenting to hospital. However, details pertaining to the impact on ambulance and hospital services were not reported. Conclusions: There is minimal research focusing on the impact of mass gatherings on in-event and external health services, such as ambulance services and hospitals. A recommendation for future mass-gathering research and evaluation is to link patient-level data from in-event mass gatherings to external health services. This type of study design would provide information regarding the impact on health services from a mass gathering to more accurately inform future health planning for mass gatherings across the health care continuum.